God’s own country: Louise Jones reviews the York Mystery Plays in York Minster. The York Mystery Plays at York Minster. Photo: Anthony Chappel-Ross. It brings a whole new dimension to Yorkshire’s reputation as ‘God’s own country’ when God himself steps down from Heaven and talks to man with a thick Yorkshire accent. This is of course peak Mystery Plays: first performed in the mid-14th century, the cycle plays were brought to the streets of York in order to make religion more widely accessible. But there’s also been an association throughout the plays with the people behind each sequence, the people who made York the beautiful and thriving city it is today. True to heritage, the sense of unity across the city is alive and well in a vibrant, modern celebration of the York Mystery Plays. Mike Poulton’s writing is careful to stick with the original text’s geographic roots, reflected in the lilting metre of verse which best suits a Yorkshire dialect. 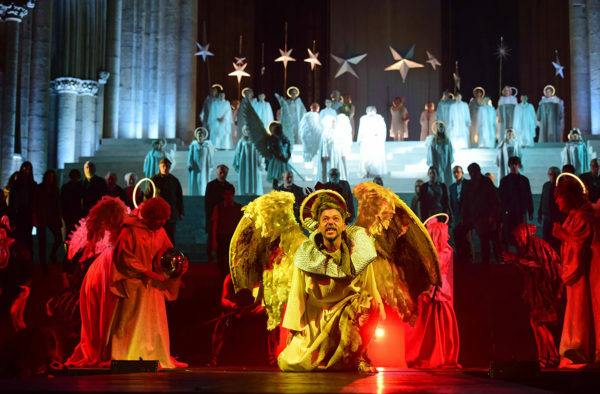 That said, the play is framed with Latin scripture, aping a classical style as Ian Small’s God emerges in robes with an ancient Greek theatrical mask. Vernacular takes over, continuing the shift from Latin texts to English oral translations of the Bible. Careful consideration is given again in the choice of alliteration used by Pilate (Philip Masey) and Caiaphus (Paul French). A heated discussion between the two turns plosive, giving the actors a chance to really spit their lines at one another as the trials of Jesus come to a head. Poulton brilliantly matches their heated arguments when Caiaphus questions Jesus, only to be met by softer, sibilant sounds. Immediately we understand that Jesus has taken the passive and pacifist role within these scenes. Academic fangirling aside (look at me, making the most of my literature degree with a module in Medieval texts), there’s plenty to show for Philip Breen and Becky Hope-Palmer’s direction and the subtle ways it takes steps in transferring the Mystery Plays to suit a more progressive audience. Whilst there is no amending the fact that it is Eve who instigates original sin, the relationship between Christine Barnes and Bob Mallow’s Eve and Adam is not as irreparably damaged as it seems in previous depictions of the Fall of Man. Rather than threatening, Adam berates Eve in almost sitcom-esque levels of exasperation. The humourous route is a charming one, which deftly diverts the tone from an otherwise dark one. Thusly they avoid the connotations and undercurrents of misogyny present in some readings of lapsarian literature. Admittedly, sometimes this is done at the expense of a greater pathos. Noah’s wife begging to bring her family with her is overlooked for an extended sequence of loading the animals onto the Ark. Whilst we no longer see the human aspect of the Flood (wiping out greater mankind of course comes with the acceptance of Noah’s family that they must sever the outside ties with their children, spouses etc. ), we do see a more universally entertaining scene which in turn creates more dynamic movement across the stage. Even the simplest of quirks such as the waddling penguins atop the shoulders of the chorus creates an effective addition to the menagerie unfolding on the beautifully crafted stage. The change of tone which has the greatest impact is the treatment of the scene Joseph’s Troubles. Dealing with issues of immaculate conception versus Joseph’s initial disbelief, this scene has a tendency to run the risk of carrying a sinister edge. Indeed, the last fixed stage performance of these plays in 2012 was depicted almost as a kitchen sink drama when it came to Joseph’s violent refusal to accept Mary’s narrative. Instead the dynamic between Ruby Barker’s Mary and Mark Comer’s Joseph is every bit as caring and tender as befits the beginning of such a vitally important Biblical cycle. Observing the age difference, it’s refreshing to see Barker’s unwavering faith opposite Comer’s utter bewilderment. We later see Comer’s eagerness to embrace his newly adopted fatherhood status, even extending this role to his young bride. An act so small as refusing to let Mary carry a bundle of clothes reflects both Joseph’s frailty and his sense of duty, securing Comer as one of the strongest performances in the night. Philip McGinley’s Jesus is an exquisitely sympathetic portrayal, focussing the admitted flawed divinity which comes with Jesus’ growing up in an environment filled with mankind and sin. It perfectly mirrors and contrasts with Toby Gordon’s Lucifer, another flawed divine creature who refuses to accept this infallibility. Both actors approach silently, McGinley’s presence filling the Minster with warmth whilst Gordon chills the air on his entrance. The Temptation in the Wilderness is an excellent chance to watch these great talents lock horns and really command the site specific stage. Set pieces and costuming are enough to make the breath catch in your throat, giving the Mystery Plays an overall appearance of an Epic piece of theatre. The Minster’s extravagant architecture serves as a silent member of the cast- it’s a happy coincidence that the darker scenes correspond with the sun setting through the stained glass windows, but it does feel that the Minster itself is playing a part in creating such an arresting atmosphere. With only a week left, be sure not to miss such an incredibly impressive labour of love that celebrates unity and the continuation of great storytelling. The York Mystery Plays are on until 30th June 2016. Click here for more information.